Once you hit level 20 in Destiny you can't increase your Level by earning XP anymore. Instead, you need to find and equip Rare (blue), Legendary (purple) or Exotic (yellow) armour with Light levels to increase your rank beyond level 20. The Light level is essentially another levelling system in Destiny which relates solely to armour. Don't confuse Light levels with Motes of Light which are completely different. Each piece of armour has a certain amount of Light, from 0 to 30. 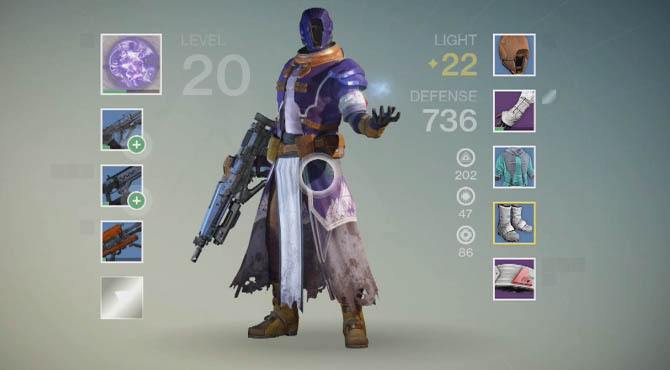 As mentioned above you need to find and equip Legendary or Exotic armour with light Levels to increase rank. Collecting new engrams and increasing your reputation with the Cryptarch is the primary way to acquire armour with Light Levels. 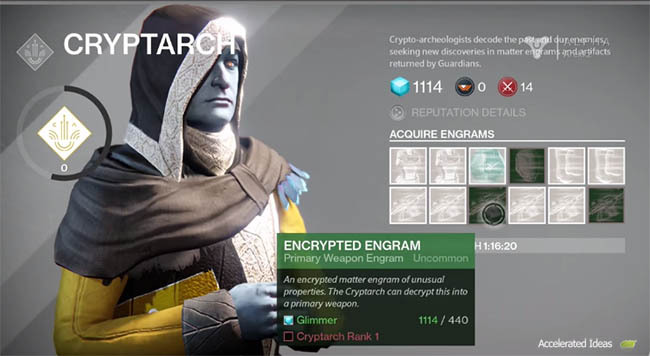 Engrams are randomly dropped rewards that can be traded with the Cryptarch at the Tower. They reward you with a random weapon/armour of that class and type. There's no particular location or method for obtaining Engrams but higher risk missions such as Strikes will give you a greater chance of earning them. Your level will also determine the type of Engram you're likely to find, with Blue being more common and Purple the hardest to collect. Not only can you trade in Engrams for gear but you can also buy Legendary (purple) gear from the Cryptarch when your reputation is high enough. A tried and tested method for increasing the Cryptarch Reputation is to constantly trade in Blue engrams which reward you with 150 Rep. This is in contrary to buying your way to a higher Rep by buying white and green Engrams which is a complete waste of Glimmer and time. For reference, you need roughly 3000 Rep to increase the Cryptarch rank. Once you've reached the higher rank, you can simply wait for stock to refresh and buy the desired purple armour with attached Light levels. Exotic gear comes with Light levels and you can buy this gear from Xur, The Agent of Nine. He's a mysterious Vendor who only appears at the weekends in the Tower. Note, you can't trade Glimmer with him, instead you need to spend Strange Coins which you earn from Strikes and sometimes via Crucible matches. Learn more about Strange Coins. Earning Crucible or Vanguard marks will earn you reputation. Gaining enough reputation will unlock purchasable Legendary gear from the Vendor. Learn more about Vanguard Marks and Rep.
Raids are unlocked when you reach level 25 (although it's advisable to be well above level 25 to stand any chance of completing a Raid). This means that you must have at least a Light level of 65 or above to compete with other players in the toughest Raids in Destiny. Even if a piece of armour is blue, purple or yellow it doesn't necessarily mean that it will have light levels. Check the details for the gear before deciding to keep and equip, or sell off. Only replace a piece of gear if the new gear has a higher light level than the one you currently have equipped. Sometimes a Blue Engram will turn into Purple gear, and vice versa. You're never guaranteed the final item.